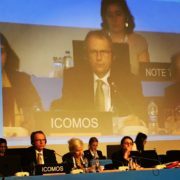 World Heritage Committee Meeting in Istanbul! The World Heritage Committee suspended its 40th session, commenced in Istanbul in July 2016, following disruptions and concerns arising from an attempted military coup. The Session will now resume in Paris in October 2016. Prior to the suspension the Committee had completed assessment of new nominations to the World Heritage List and consideration of ‘state of conservation’ reports for more than 50 properties, including every property that is currently included on the List of World Heritage in Danger. 21 new properties were inscribed on the World Heritage List, including the Archaeological Site of Philippi (Greece), Antequera Dolmens (Spain) and Ari (Turkey). A serial listing for the Architectural Work of Le Corbusier, spread across seven countries and Nan Madol – a ceremonial centre within the Federated States of Micronesia – were among the other inscriptions. “the Committee sessions are like an iceberg – what occurs on the podium and in the public forum is only the small tip of months of advisory work and liaison, plus behind-the-scenes bilateral meetings. At this Committee session, it was inspirational to be part of a process that is so important in caring for the jewels of humanity’s common heritage” he said. http://www.mackaystrategic.com.au/wp-content/uploads/2016/08/RM-on-podium.jpg 1280 1280 Richard Mackay http://www.mackaystrategic.com.au/wp-content/uploads/2015/09/mackay-strategic-web-logo-300x103.jpg Richard Mackay2016-08-08 09:04:192017-11-24 08:49:03World Heritage Committee Meeting in Istanbul! BIG DIG Archaeology Education Centre turns 50,000!